You will know a serious gardener not by his/her build but by their tools. Their primary objective is efficiency – efficiency in planting, watering, and composting among other things. It is a way of life for some and others, a passion. Proper equipment complements skills in a significant way, and a wheelbarrow is a standard feature in the majority of gardeners’ yards. They help to keep everything moving. The following is a review of the best wheelbarrows on the market at the moment. Have a look! Traditional: these old models are still prevalent among many homesteads because they are easy to use and more importantly, they are cheap. Hybrid: old models have one wheel and a broad basin. However, the newer models have two or more wheels that make hauling more natural and fun. Electric: these are the most hi-tech and expensive wheelbarrows. However, they are not popular as most gardeners do not find them as comfortable to use. Heavy or Light Loads: wheelbarrows are designed to make your work hauling items to and fro your garden easier. However, they come in varying designs. Some are best suited for carrying heavy loads like that 50kg fertilizer and so they have a sturdy construction. Wheelbarrows made of galvanized steel and solid or pneumatic wheels are an excellent choice for heavy loads. If you are carrying heavier items, then a wheelbarrow with the parking brake and tipping mechanism will be sufficient. The Design: good wheelbarrows are designed to make work relaxed for you. After all, why else would you be going for them? The best design for a wheelbarrow includes low handles as they will not require much effort to lift. It can be pretty uncomfortable if the hand grips are rough and that would make heavy hauling items to the garden hard. 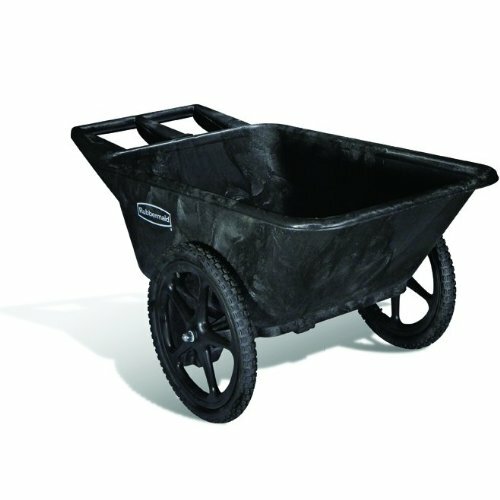 Just like a backpack has padded shoulders, the wheelbarrow you choose should have soft and comfortable handles. A narrow tray will make it easier for you to pass through various gates. Innovative: the primary goal is to ensure that your task of carrying items to the garden is as easy as possible. Therefore, the best wheelbarrow is the one that allows you to do that. A generous tray with tool grooves is an excellent addition to the wheelbarrow. The grooves will allow you to carry long tools like the rake. If you find one with scales marked inside, the better. It will do more than carrying compost but also use it to mix. Smooth operation: no one wants something that goes making noise announcing your arrival. A good wheelbarrow should allow you the benefit of gardening in a quiet environment – you know, something about gardening being therapeutic like yoga. Don’t let the peace break by having a wheelbarrow that will go producing too much noise. Purpose: some barrows are designed for specific purposes. For example, there are those made for moving plants. They don’t have a lot of features but are mostly four-wheeled. You cannot purchase such a wheelbarrow only for you to use it carrying large boulders – it will disintegrate into several pieces in no time. Rust Resistant: for the sake of having a wheelbarrow for an extended period, it is best that the tray and other parts are rust resistant – you don’t want the wheelbarrow looking like it has seen better days. If you can get a wheelbarrow with a tray made of high-grade plastic, the better. If not, just go with the one made of stainless metal. 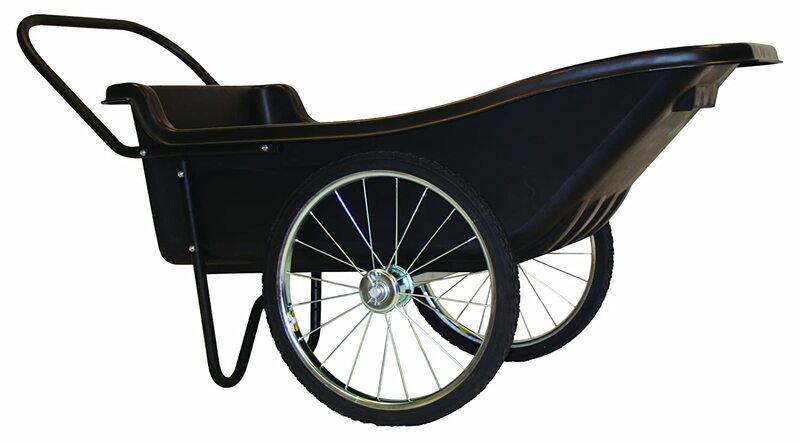 The Number of Tires: the most common wheelbarrow is one-legged. However, wheelbarrows with more than one wheel are now more common than ever before. The one tire wheelbarrow is sometimes harder to handle especially if you are going uphill. However, it is the best when moving on narrow pathways. The majority of gardeners would go with the double wheeled barrows based on the stability they provide. They are also easier to handle. The four-wheeled type is just like a push cart that you can drag behind with so much ease. The Type of Wheels: pneumatic wheels resemble car wheels and can comfortably move on any terrain. They readily absorb shock better than any other type making movement of items from one place to the other pretty quickly. Some of the cheap models in the market may have plastic wheels. Avoid them like the plague unless you intend to have one massive spill of compost on your veranda, once in a while. The Grips: the best handles make handling of the wheelbarrow easy. They have plasticized or rubberized grips that are gentle on your hands – the goal here is apparently not to have your hands looking like they can qualify for an audition in an alien film. Gardening involves a lot of moisture and chemical handling which can affect any metal equipment. 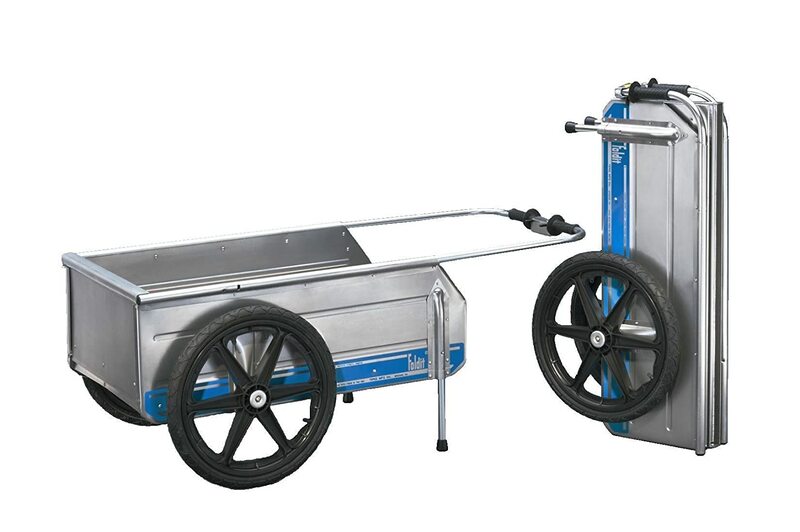 With this utility cart, you will never have to worry about corrosion. It is made of marine-grade aluminum meaning that it can withstand the elements quite easily. The product’s hauling capacity is also functional – up to 5.75 cubic feet. It has pneumatic tires that make it easy for movement from one place to the other. This cart is foldable, and so you will not have to worry about storage space. It is especially suitable for hauling compost and mulch from one place to the other. 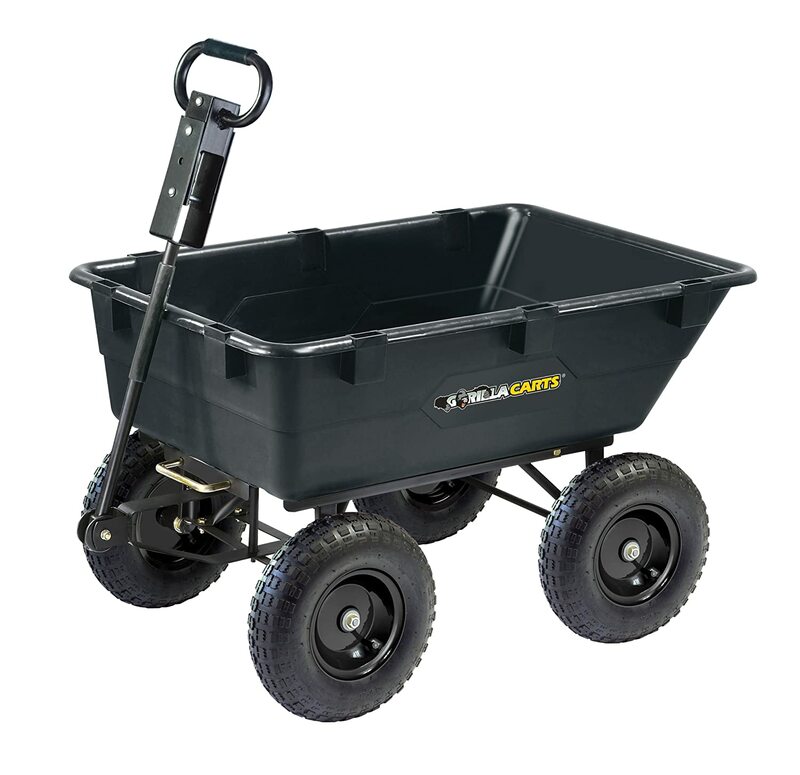 This is quite the heavy duty hauler and can handle anything you throw at it – isn’t this what you want as a gardener? There are not many wheelbarrows you will find in the market that has hauling capacity of up to 1200 pounds like this one. That means you can finally take all the compost from your all your bins in one go. You can either pull or hook this cart to a tractor with all your stuff in it. And what’s even more interesting is the quick-release dump design that makes unloading such a small task. Apparently, the best wheelbarrow doesn’t rust, peel or chip and this product qualifies as one of the best based on this. The wheelbarrow is easy to move around and you will not have to exert a lot effort – ladies can comfortably move it around. It has tall solid wheels that moving it around is a piece of cake regardless of the terrain. However, you will have to deal with raking some of the stuff out because it is not effective in dumping out. Made of durable polyethylene material, this product is probably among the best for hauling gardening items. The cart is quite easy to assemble, and you will not wonder where everything should be. It is rustproof, and you don’t have to worry about want you are transporting – it can be compost or nitrogen fertilizers. The polyethylene tub has a smooth surface making simple to clean. The solid rubber tires move to and from quite smoothly and easy. All in all, this may be one of the best wheelbarrows you can have around in your garden. The best wheelbarrow is easy to lift and move. Similarly, this product has a low lifting height, so you do not tire handling it. The wheels are flat-free meaning that they will never go flat. It also has an adjustable center of gravity that may make hauling very easy. The ergonomic lift design makes it easy to carry heavy items without any strain. It comes with a 300-pound weight capacity which may be more than enough for a typical gardener. The best wheelbarrow is the one that is easy to use, has a sturdy construction, a good wheel, is durable and has a non-corroding body. The above wheelbarrows are great options. However, Tipke 2100 Marine Fold-It Utility Cart ticks all the right boxes to come out the winner in this review. 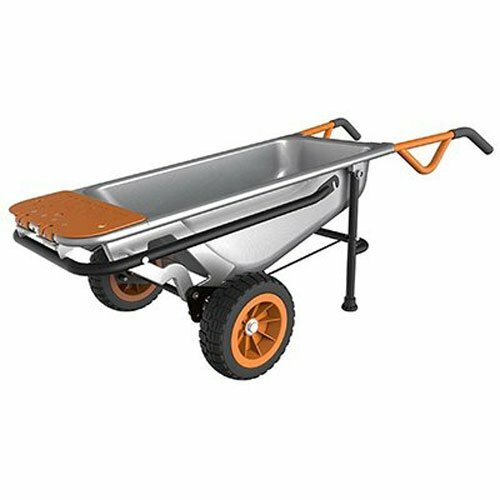 The wheelbarrow is durable, with a non-corroding body and is foldable – quite the space saver during storage. The wheel is easy to use and has a decent capacity for hauling most of the things on the farm. With this cart around, your gardening can never be such fun.